One of the strengths of an online computer game is that what you see when it first appears is not necessarily what you get if you pick it up years later. With most media, of course, precisely the opposite is true. The content of a novel’s ninth printing is the same as the first. Likewise, it is considered sacrilege for a painter to lay so much as a drop of pigment on a work once it leaves the studio. “Remastered" is a common marketing hook in the music business but, ultimately, that version of Crosstown Traffic on the umpteenth Jimi Hendrix compilation is much the same as the rendition that hit the airwaves four decades ago. That process of continual refinement has never been as effective as it has been for Eve Online, the science fiction game first opened to the public by Crowd Control Productions (CCP) of Iceland in May 2003. More than four years after its debut, when most games are either a distant memory or provoking burnout among long-time players, Eve is only now hitting its stride as one of the most interesting games in the world. After all, what other game has a PhD economist on the staff who publishes a quarterly newsletter about the game’s virtual economy? What other game recently announced plans for an elected player council with ideas drawn from philosophers ranging from Aristotle to John Rawls? Eve takes place in a fictional galaxy in a far future, where humanity has splintered into four competing factions—the theocratic Amarr, the militaristic Caldari, the liberal Gallente and the rebel Minmatar. Players choose a side and find their own path. With its formidable depth, complexity and Kilimanjaro-like learning curve, Eve will never rival World of Warcraft and its nine million customers for mass market appeal. But at a stage when most games have long since stagnated, Eve continues to grow, recently passing 200,000 subscribers. 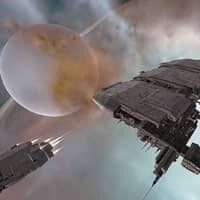 Recently, Eve set a record for any game when it recorded 37,729 simultaneous players in its common virtual universe. Explaining that statistic should go a long way towards explaining what makes Eve unique. In most online games, players are split among dozens or even hundreds of identical copies of the game world, known as servers. Each server generally has a total population of around 10,000 players. In World of Warcraft, for instance, the game’s roughly 2.5 million US customers are divvied up among about 220 servers. At any given moment, each server has at most only a few thousand users actually playing the game (people do have real-world obligations, after all, such as sleeping). Moreover, in most games, users are segregated according to language and nationality. Because the total population of each server is so small, it is vital to provide a critical mass of players who speak the same language and play in common time zones. In many ways, Eve is more like the real world. All 200,000 of Eve’s players exist in one huge virtual galaxy spanning thousands of solar systems. About 40% of Eve’s players are European, another 40% are North American, and about 20% are from other continents. They all share one polyglot community around the clock, and at any moment, tens of thousands of users are logged on. More important, the economy and politics of Eve are almost entirely driven by the players themselves. Miners drill asteroids and sell their ore to industrialists who construct spaceships and weapons at orbital factories. Industrialists then sell their wares to vast fighting forces that battle for control of entire regions of space. Other players make their living as full-time traders, scrupulous or otherwise. If another player cheats you, you can take it lying down, retaliate on your own or hire mercenaries to exact revenge. The most compelling aspect of Eve is that once players control a region of virtual space, they bear the responsibility of policing it, setting taxes, establishing diplomatic relations with neighbouring groups and waging battles to protect their territory or take more. In most online games, the advanced content involves getting together with a few dozen friends to battle computer-controlled dragons and demons. In Eve, major battles involve hundreds of players fighting in starships in vast Star Wars-like firefights. At the strategic level, coalitions involving tens of thousands of players struggle for months over strategic objectives or simply to wipe out their enemies. For at least a year, the most powerful group in Eve has been an alliance known as Band of Brothers—a self-appointed evil empire with the stated objective of taking over the galaxy. Against them is arrayed a motley batch of self-styled freedom fighters with names such as the Red Alliance (mostly Russian), Tau Ceti Federation (mostly French), GoonSwarm (mostly obnoxious) and the Interstellar Alcohol Conglomerate (mostly drunk). “There are basically two schools of thought for operating an online community," Hilmar Petursson, CCP’s chief executive, said in a telephone interview. “There is the theme-park approach and the sandbox approach," he continued. “Most games are like Disneyland, for instance, which is a carefully constructed experience where you stand in line to be entertained. We focus on the sandbox approach where people can decide what they want to do in that particular sandbox, and we very much emphasize and support that kind of emergent behaviour."